I use Positive Reinforcement Methods, and am able to mix that where necessary, with other training methods. With 25 plus years of working with dogs of all breeds and extensive knowledge on breed traits, and canine behaviour I am able to find a suitable method or combination of methods to train your dog. I am aware that although the tools and techniques, for training dogs has changed the over the years, some methods have proved to more effective than others. I apply different techniques, dependant on breed, age, issues etc. I found with my own dogs, that with a combination of methods they became better more reliable dogs. However, I strongly believe that all puppies should only receive positive training, older dogs can some times, benefit from correction training methods. My policy is to present as many humane and effective options as possible for training, behaviour modification. "Causing Pain Is No Way To Train." Therefore I do not agree with the use of Pinch Collars and Electronic Shock Collars. "Marcia is a trainer with over 20 years experience and it shows, she takes into account the dog owner/dog team. Very personable she understands that every team is unique and does not use a cookie cutter approach when training a dog. Lynne McCarthy, ASID has endorsed your work as Owner at The Dog Nanny. Judith Dremin has endorsed your work as Owner at The Dog Nanny. 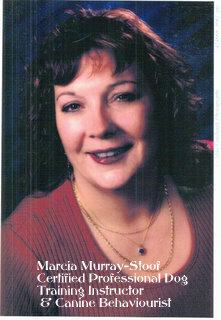 "Marcia has in-depth knowledge of dogs and dog behaviour. She also has the people skills to work well with the people who bring their dogs to her. The result? Better dogs and happy clients." "I met Marcia when I first applied to be a volunteer with Therapeutic Paws of Canada. Marcia has a wonderful gift at working with dogs and people. She has a deep appreciation and respect for dogs and reminds others to always be attentive to the needs of a dog."